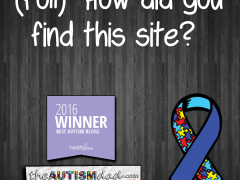 Rob Gorski October 1, 2016 April 4, 2018 No Comments on (Autism Poll) How did you find this site? 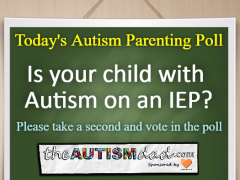 (Autism Poll) Is your child with Autism on an IEP? Rob Gorski September 30, 2016 April 4, 2018 No Comments on (Autism Poll) Is your child with Autism on an IEP? 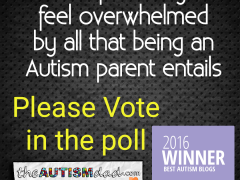 Please take a second and vote in today’s #Autism #Parenting Poll. Today’s topic is IEP’s.. Check it out at the link below and share it so we can include as many people as possible. 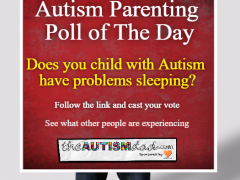 (Autism Poll) Does your child with Autism have issues sleeping? Rob Gorski September 29, 2016 April 4, 2018 2 Comments on (Autism Poll) Does your child with Autism have issues sleeping? Autism Parenting comes with blessings and sacrifice. One of the biggest sacrifices come in the form of sleep deprivation. Please take a second and share your experience with sleep by voting in the poll. Feel free to share this poll with your friends and see how your experience stacks up with that of other #Autism parents around the world. Today’s poll is all about being overwhelmed. Please take a second and vote based in your experience. Please feel free to pass this along and help me gain more insight into the lives of Autism families. 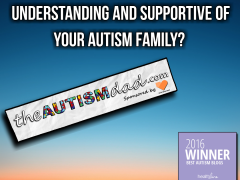 Rob Gorski September 25, 2016 April 4, 2018 2 Comments on (Autism Poll) Are the people in your life understanding/supportive of your #Autism #Family?